Changing industry standards for OEMs Enginers & contractors: one year on! In 1998, Google was founded, the first Apple iMac was introduced and the legendary Windows ’98 was released by Microsoft. In a less glamorous but equally important corner of industry, a new commission was being formed to revise the complex IEC 60439 industry standard, which governed the safety and performance of electrical switchgear assemblies. Although Windows ‘98 has long been consigned to history, the new industry standard – BS EN 61439 – only became mandatory on November 1, 2014. One year on, Pat McLaughlin, Boulting Technology’s Operations Director, evaluates how original equipment manufacturers, panel builders, electrical engineers, consulting engineers and contractors have been affected by the new BS EN 61439 standard. In a market where the demand to optimise and reduce costs blends heavily with higher needs for assembly flexibility, the introduction of a new set of standards was needed to guarantee the performance of Low Voltage Switchgear Assemblies. Switchgear and Control Gear assemblies are multifaceted and have an endless number of component combinations. Before the introduction of the new standard, testing every conceivable variant was not only time consuming and costly, but impractical. The intricate character of assemblies also meant that many did not fit into the previous two testing categories: Type Tested Assembly (TTA) and Partially Tested Assembly (PTTA). For example, panels which were too small to be covered by TTA and PTTA fell outside the standard. Finally, in the case of a PTTA, ensuring the safety and suitability of a design was often dependent strictly on the expertise and integrity of the manufacturer. The major change introduced by the new BS EN 61439 standard refers to testing. It states that the capabilities of each assembly will be verified in two stages: design verification and routine verification. This means the new standard completely discards the type-tested (TTA) and partially type-tested assemblies (PTTA) categories in favour of design verification. Although BS EN 61439 still regards type testing as the preferred option for verifying designs, it also introduces a series of alternative routes to design verification. The options include using an already verified design for reference, calculation and interpolation. The BS EN 61439 standard specifies that specific margins must be added to the design, when using anything other than type testing. One of the main benefits of the new design verification procedure is its flexibility. Under the old BS EN 60439 specification customers would demand a Type Test certificate for each assembly particularly Incoming Air Circuit Breakers, which was very expensive and time consuming. The new standard allows users and specifiers to pertinently define the requirements of each application. Annex D of the BS EN 61439 standard provides a list of 13 categories or verifications required, what testing method can be used and what comparisons can be made. In order to optimise testing time, the standard allows derivation of the rating of similar variants without testing, assuming the ratings of critical variants have been established by test. The second major change implemented by the new industry standard refers to the responsibilities of each party involved in the design, test and implementation of low voltage switchboard assemblies. Unlike BS EN 60439, which stated the OEM or the system manufacturer was solely responsible throughout the testing programme, the new standard divides the responsibilities between the OEM and the assembly manufacturer, or panel builder. The new standard recognises that several parties may be involved between concept and delivery of a switchboard assembly. The OEM is responsible for the basic design verification. In addition, the assembly manufacturer is meant to oversee the completion of the assembly and routine testing. 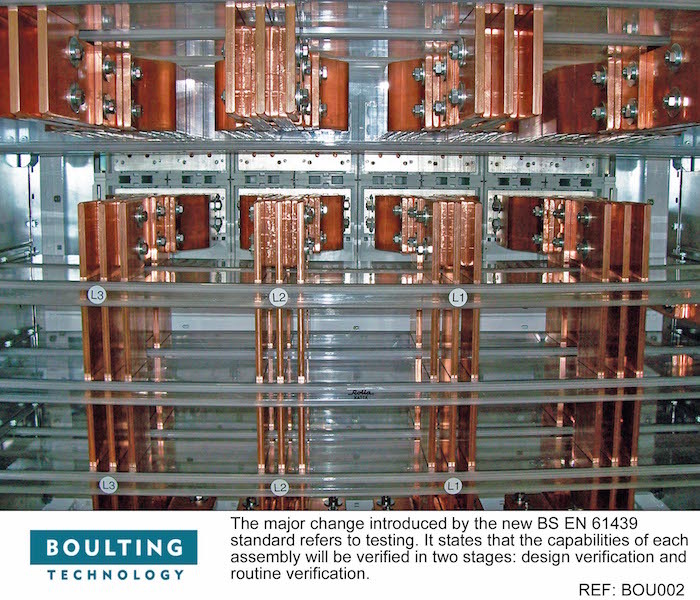 For innovators like Boulting Technology, the new BS EN 61439 has brought more freedom and flexibility when designing switchboard assemblies. For example, Boulting Technology has designed and launched the Boulting Power Centre, a range of low voltage switchboards, which are available in 25kA, 50kA, 80kA and 100kA, fault ratings, and up to 6300Amp current ratings. Although change is never much fun, it’s what technology and industry are all about. If this wasn’t the case, we would all still be using Windows 98 or the indestructible Nokia 5110. You are currently browsing the archives for the Panels category.